UI maintains an online chemical inventory system to facilitate federal and state regulatory reporting (ex. Department of Homeland Security; EPA Tier II, Right To Know, etc.). In addition, the system fulfills an agreement with local emergency response agencies, allowing them to access information regarding possible chemical hazards in cases of emergency. The online system that The University of Iowa uses is called EHS Assistant (EHSA). All chemicals and chemical products should be maintained in the inventory. Biological materials, radioactive materials and office supplies do not need to be maintained in the inventory. Accounts, buildings, rooms and user access must be added (and removed) by EHSA Administrative personnel. EHSA utilizes each person’s own unique University of Iowa hawkID and password to log-in. From the UIowa Environmental Health and Safety (EHS) site, click on “EHS Assistant Login Logo" to access the EHSA site. Fill in your hawkID and password. If you receive the message “Authentication error- Unable to Bind User: Invalid Credentials” you have likely entered either your username or password incorrectly. Both username and password are case sensitive. If you receive the message “Authentication error- Invalid Credentials”, contact EHSA administrative personnel to have an account set up within EHSA. If you are certain you already have an account in EHSA, you may have entered an incorrect username and password. If you work in the hospital or CCOM, make sure that you are using your University hawkID and password, not your hospital ID and password. Note- messages from EHSA administrative personnel regarding the system will be displayed in the upper right corner of the log-in. It is recommended you create a shortcut to the log-in page on your desktop rather than a bookmark in your browser. To create a shortcut, right-click on your mouse while on the log-in page, before logging-in. Select “Create Shortcut” from the menu that appears. This will add a shortcut icon to your desktop. You can then access the website directly by clicking on that icon in the future. Those who work for multiple PI’s (also known as Chemical Owners) will see a list of names from which to choose. Those who work for only one PI will skip this step and go directly to the Main Page. Only those PI’s to whom you have been authorized will appear in your list of options. For example, if you have been authorized to three PI’s, the names of those three PI’s will appear in your list but if you work for two PI’s, only two PI’s will appear in your list. Click on the PI (or Chemical Owner) name whose inventory you wish to view. You will be taken to the Main Page for the PI you selected. Upon logging-in, and choosing a PI if applicable, you will be brought to the Main page. To access the inventory, click “Inventory”. To access the annual chemical review statement, click “Chemical Review Statement”. The date of the last time your lab completed the Chemical Review Statement is displayed below the Statement link. For those with multiple PI’s, if you wish to return to your list of PI options, click “Choose PI”. From the Inventory Page you can sort, search and transfer your inventory, make simple edits to chemicals already saved in the inventory and access various reports. Searches can be conducted based on chemical name, formula, location, CAS #, receipt date range, expiration date and others. Click the radio button next to your search topic of interest. Fill in the search criteria using the drop-down menus and type-able fields that appear. 3. Click “Show”. The search results will appear below. You may sort the inventory by clicking on any column heading. To sort the entire inventory at once, first click “All Items”. Click the column heading by which you wish to sort the inventory. One click will sort items into ascending order. A second click will sort the list in reverse order. Ex. : clicking the heading Storage Location will sort all the displayed chemicals in order from A-Z based on their listed storage location. A second click will sort it in Z-A order. Three values may be changed on the Inventory Page for items already in the inventory- Total Containers, Quantity per Container and Units. Make the necessary changes in the appropriate fields, either by typing in the new value or by using the drop-down menu. Note- You may make multiple changes before clicking “Save Changes” but you must save your changes before moving to another screen or your changes will be lost. The system provides a means of downloading your inventory into both Excel and PDF formats. Seven different reports are available. Click on the report of interest from the drop-down menu. Depending on your computer and/or browser’s security settings, you may need to disable your browser’s pop-up blocker or permit downloads. Your report will open automatically in Adobe or Excel. The EHSA system provides access to SDS’s for the chemicals in your inventory. The system will conduct a Google search for SDS’s based on the chemical description and vendor listed for any particular chemical. A new window will open, displaying the Google search results. Note- alternate SDS location information can be stored in an individual chemical’s “Supplemental Chemical Information” on the Add/Edit page. Anytime you purchase a chemical or take possession of a chemical from another lab, you need to add it into the inventory. On the Inventory page, click “Add Chemical”. You will be taken to the Add page. Fields in the pink box are required and must be completed. All other fields (those in gray) are optional but we encourage you to fill in as much information as possible. Please enter the CAS # whenever possible. Note- on the Add page, clicking on any information button will provide you with a menu of saved information. Note- EHSA is equipped with a catalog of thousands of common chemicals and chemical products. By using the chemical catalog, many fields can be auto-filled for you. An auto-search of the catalog can be accessed at the top of the page, or a detailed search can be accessed by clicking the information button next to the Chemical Description or CAS# fields. To search the chemical catalog, begin typing the name of the chemical in the “Search By Chemical Description” field or the CAS# in the “Search By CAS#” field at the top of the page. A drop-down list of matching chemicals will be displayed. Click on the appropriate chemical listing. The chemical description and any other saved information regarding that chemical will be inputted into the corresponding fields.If the chemical you wish to enter is not in the chemical catalog, click “Not in Catalog” and then type in the necessary information by hand. Once you select Units from the drop-down menu, the appropriate physical state will also be filled into the Physical State field. For the Building Name and Room # fields, you must click the next to the Building field. A menu of authorized rooms will appear. Click “Select” for the room where the chemical will be stored. The building and room will then be automatically filled into the Bldg/Room fields on the Add page. If the needed room is not displayed in the list then that room has not yet been authorized to your account. Contact an EHSA administrator to have the room added to your account. Continue to fill in as many of the remaining fields as possible. When you are finished entering data, click “Save/Return” or “Save & Add Another Chemical”. Or, if necessary for whatever reason, click “Cancel”. If you indicated you have multiple units of the same item (for example, two 4-Liter bottles of acetic acid), the system will ask you if you wish to have the items displayed individually or collectively. A more detailed chemical search page can be accessed by clicking the information button next to “Chemical Description” or next to “CAS #”. You will be taken to the Chemical Catalog detailed search page. Click the radio button next to the search topic of interest and, if applicable, select the appropriate item from the drop-down menus. If needed, type in what you wish to find. You may sort results by clicking on the column headings of the results. Click on the appropriate chemical listing and the system will fill the information into the corresponding fields back on the Add Chemical screen. On the Inventory page, click “Remove” in the row of the item you wish to discard. You will be asked the reason for deletion. Select a reason from the drop-down menu. You may re-activate chemicals you have previously deleted from the inventory. On the Inventory page, click the radio button by “Disposed Inventory”. Click “Activate” by the chemical you wish to restore into the current inventory. Disposed inventory will be archived periodically. The archived inventory may be viewed by clicking “Archived Inventory”. Those working with multiple PI’s may combine inventories by clicking “Authorized Personnel”. To transfer chemicals between rooms, bring up the inventory of the room you wish to transfer from by clicking the radio button next to “Show Chemicals by Location” and selecting the appropriate room from the drop-down menu that appears. Once the inventory appears below, click “Transfer”. A transfer box will appear. Click the . A list of approved rooms will appear. Chose the room to which you wish to move the chemical(s). The room will then be filled into the field for you. If the room into which you wish to move the chemicals does not appear in the list of approved rooms that indicates your account has not been authorized for that particular room. Contact an EHSA administrator to have the room added to your list of locations. Click the appropriate radio box to indicate whether you wish to transfer only the selected chemical (highlighted in green) or all chemicals from the original room to the other room. Every year you will be asked to verify the content of your lab’s chemical inventory to facilitate Department of Homeland Security reporting requirements. After making any needed updates to the inventory, on the Main page, click “Chemical Review Statement”. 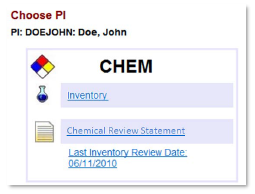 The name of the PI (or Chemical Owner) should be displayed in the “Inventory Reviewed By” field. Note- Although someone other than the PI may be completing the update and review of the inventory, those users authorized to update the inventory are acting as proxies for the PI and the PI remains the ultimately responsible party. Click the drop-down button on the Date field to select the appropriate date. When you are finished in the program, click “Log Off”. Can I use EHSA on a Mac computer? Yes, EHSA works on both PC’s and Mac’s. Can I use EHSA on browsers other than Internet Explorer? Yes, EHSA also works on Firefox, Safari and Chrome. Can I access EHSA off-campus? If you have been authorized to remote log-in to a campus computer, you can access EHSA while off campus; otherwise you cannot access EHSA off-campus. I bookmarked the Log-in website in my browser. Now I see a message about restarting the application. What do I do? This happens because the inventory system is accessed through an Internet browser but is not actually an Internet website. Click “Restart the application” to access the log-in page. To avoid seeing this message in the future, create a shortcut on your desktop rather than a bookmark/favorite in your browser. Yes, read-only accounts can be created at the request of the PI/Chemical Owner. Our lab has made significant changes to our inventory. Is there a faster way to update our inventory in EHSA? You may send an Excel file of your inventory to EHSA administrative personnel for uploading into EHSA. Excel files can be uploaded to completely replace or add onto the inventory already in EHSA. If you have an inventory already in EHSA, it is recommended that you download your current inventory via the report feature. Make all changes to that downloaded Excel and then send a copy of that Excel to EHSA administrative personnel to have it uploaded. This will preserve as much information as possible without requiring you to re-type in the information. If you are new to EHSA, contact EHSA administrative personnel to obtain the proper Excel template. My lab has moved. How do I get the pre-saved building/rooms in our account changed? The EHSA administrators must make this change. Send them an e-mail that lists the name of your PI and what new buildings and rooms you need added to your account. You may also request that the administrators transfer your inventory in bulk to the new rooms. Who can access my EHSA inventory? PI’s or Chemical Owners are automatically given access to their own inventory. Personnel within a PI’s lab may be granted access to the inventory account upon request, with permission from the PI. Users may be added or removed at any time. Access must be set-up by the EHSA administrators. To request access, e-mail the name of the person needing access, the type of access needed (modify-rights or read-only) and the PI’s inventory to which they need access to the EHSA administrators. In addition, Coralville and Iowa City first-responders have read-only access to inventories for emergency situations. How do I add or remove people who have access to my inventory? Chemical Owners/PI’s should contact EHSA administrative personnel to request access for new employees or to have departed employees removed from their account. Each PI or Chemical Owner should periodically check to see if the list of workers associated with them in the ESHA database is accurate. How can I ensure good quality inventory data? When adding a chemical, use the chemical catalog to select a chemical name whenever possible. This will minimize data entry spelling errors and duplicate entries and allow for easier searches. Enter a CAS# whenever possible. Fill in as many information fields as possible. If you cannot find the chemical you wish to enter in the chemical catalog, please e-mail an EHSA administrator so that the chemical can be added into the catalog. In your e-mail, please include the chemical/product name and the CAS# (or the vendor, if it is a product). I cannot find the chemical I wish to enter in the chemical catalog. What should I do? Please e-mail an EHSA administrator the chemical/product name and the CAS# (or the vendor, if it is a product). They will add the chemical into the catalog. My inventory quantities change all the time. What quantities do I enter? You may enter the volume of the full original container even if partially used. Ex: A 500-g bottle of NaCl may be listed as 500-g even if there are only 478-g (or 203-g, etc.) in the bottle. You may enter a constant-stock volume. Ex: If your lab uses 6 containers of ether every month, you can keep a standard entry of 6 containers in your inventory. You do not need to add and subtract every bottle as they are purchased and used. If there is a significant change in your constant-stock quantity, up or down, put that change into the inventory. For tanks and other large chemical storage containers, contact Laurie Taylor (5-8031) or Rick Byrum (5-9379) regarding inventory quantities. How do I comply with the bimonthly requests from EHS to update my chemical inventory for DHS COI purposes? After making any necessary changes to your inventory, select the “Chemical Review Statement” link from the EHSA main menu. Provide the appropriate information and click the Submit button to complete the update. How do I enter kits into the inventory? Kits with hazardous components should be listed by components. The kit packaging will list the mass and/or volumes of each component. How do I calculate the volume of my compressed gas tank? All gases must be listed in units of cubic feet, liters or pounds. Who do I contact with questions about EHS Assistant? Contact the EHSA administrators for assistance. Rachelle Justice (3-4692) can assist with general ESHA issues as well as provide support for research areas. Laurie Taylor (5-8031) can assist with DHS COI and DNR Tier II chemical tracking issues as well as provide support for non-research areas. What needs to be included in the chemical inventory? All hazardous chemicals, as defined by federal regulations, need to be included in the inventory. A general rule of thumb is that if it has an SDS, it needs to go into the inventory.